Bacterial pneumonia in adults carries an elevated risk for adverse cardiac events (such as heart failure, arrhythmias, and heart attacks) that contribute substantially to mortality – but how the heart is compromised has been unclear. A study published in PLOS Pathogens now demonstrates that Streptococcus pneumoniae, the bacterium responsible for most cases of bacterial pneumonia, can invade the heart and cause the death of heart muscle cells. Carlos Orihuela, from the University of Texas Health Science Center in San Antonio, USA, and colleagues initially studied the reasons for heart failure during invasive pneumococcal disease (when S. pneumoniae bacteria infect major organs such as the lungs, bloodstream, and brain) in mice, and subsequently confirmed some of their main findings in rhesus macaques and in heart tissue from deceased human patients. Mice with severe invasive pneumococcal disease showed elevated levels of troponin, a marker for heart injury, in their blood. They also had abnormal EKGs. When the researchers examined the hearts of the mice, they found microscopic sites of injury (called microlesions) in the heart muscle. S. pneumoniae were found within these microlesions, indicating the bacteria were able to invade and multiply within the heart. Looking in more detail, the researchers identified dying heart muscle cells in the tissue surrounding microlesions. At the molecular level, the researchers found that the S. pneumoniae toxin pneumolysin was present within the microlesions and responsible for heart muscle cell death. They also showed that S. pneumoniae requires a molecule called CbpA to exit the bloodstream and invade the heart. Moreover, an experimental vaccine formulation composed of CbpA and a non-toxic version of pneumolysin generated antibodies that protected mice against cardiac invasion and heart damage. 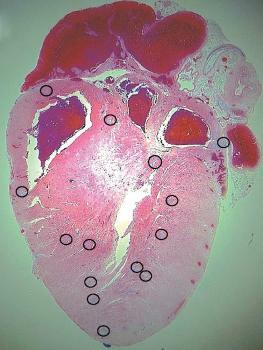 Microlesions (indicated by circles) in the heart of a mouse 30 hours after induction of invasive pneumococcal disease. Image Credit: Orihuela et al. Having obtained tissues from three rhesus macaques that had died from pneumococcal pneumonia, the researchers found cardiac microlesions that were similar in size and appearance to those seen in mice, but without the presence of S. pneumoniae bacteria. The situation was similar in cardiac samples from human patients who had died from invasive pneumococcal disease. Two of the samples (they looked at a total of nine) showed microlesions, but the lesions did not contain bacteria. As the macaques and the human patients had been treated withantibiotics, the researchers wondered whether the bacteria had caused the lesions but subsequently been killed by the treatment. To test this, they infected mice with S. pneumoniae and treated them with a high-dose antibiotic (ampicillin) when the lesions were first apparent. The hearts of these mice looked similar to the macaques and human samples, with clear presence of microlesions but devoid of bacteria. As the researchers discuss, ampicillin acts by breaking bacteria apart and releasing their contents, including pneumolysin, and this could exacerbate the death of heart muscle cells. Alternative antibiotics that do not spill their bacterial targets’ contents exist and might be advantageous. Having shown for the first time that S. pneumoniae can directly damage the heart – which could help explain the link between pneumonia and adverse heart events – the researchers conclude that “research is merited to determine the true frequency of cardiac microlesions in patients hospitalized with invasive pneumococcal disease, if modifications in antibiotic therapy improve long-term outcomes, and if prevention of cardiac damage is an indication for vaccination”.